MICHAEL POLLAN is the author of six previous books, including Food Rules, In Defense of Food, The Omnivore’s Dilemma, and The Botany of Desire, all New York Times bestsellers. A longtime contributor to The New York Times, he is also the Knight Professor of Journalism at Berkeley. In 2010, Time magazine named him one of the one hundred most influential people in the world. "As in The Omnivore’s Dilemma, Pollan is never less than delightful, full of curiosity, insight, and good humor. This is a book to be read, savored, and smudged with spatterings of olive oil, wine, butter, and the sulfuric streaks of chopped onion." "Spurred by a number of objectives—improving his family’s general health, connecting with his teenage son, and learning how people can reduce their dependence on corporations, among others—Pollan (The Omnivore’s Dilemma; In Defense of Food) came to the realization that he’d be able to accomplish all those goals and more if he spent more time in his kitchen. He began cooking. Divided into four chapters based on the four elements, Pollan eloquently explains how grilling with fire, braising (water), baking bread (air), and fermented foods (earth) have impacted our health and culture. ... Engaging and enlightening reading." “New York Times best-selling author Pollan (The Botany of Desire; The Omnivore’s Dilemma) delivers a thoughtful meditation on cooking that is both difficult to categorize and uniquely, inimitably his… Intensely focused yet wide ranging, beautifully written, thought provoking, and, yes, fun, Pollan’s latest is not to be missed by those interested in how, why, or what we cook and eat." 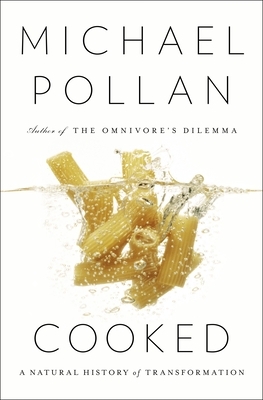 "Having described what's wrong with American food in his best-selling The Omnivore's Dilemma (2006), New York Times contributor Pollan delivers a more optimistic but equally fascinating account of how to do it right.... A delightful chronicle of the education of a cook who steps back frequently to extol the scientific and philosophical basis of this deeply satisfying human activity." "Pollan’s newest treatise on how food reaches the world’s tables delves into the history of how humankind turns raw ingredients into palatable and nutritious food. To bring some sense of order to this vast subject, he resurrects classical categories of fire, water, air, and earth… Four recipes accompany the text, and an extensive bibliography offers much deeper exploration. Pollan’s peerless reputation as one of America’s most compelling expositors of food and human sustainability will boost demand."